"A variation on the classic chocolate chip recipe, these cookies have bittersweet chocolate chips and pieces of soft-cut peppermint candy added to them, as well as the traditional semi-sweet. They're quite chocolatey and quite decadent. The peppermint adds an interesting touch." In a small bowl, stir together flour, baking soda, and salt. In a large bowl, stir together the butter, white sugar, and brown sugar until creamy and smooth. Stir in vanilla; then stir in eggs one at a time, stirring until the mixture is creamy and well incorporated. Gradually stir in the flour, 1/2 cup at a time, mixing well between each addition. Stir in the semi-sweet chips, then the bittersweet chips. Mix in the peppermint candy, stirring until evenly distributed. Drop by spoonfuls onto ungreased baking sheets. Bake in a preheated oven for 9 to 11 minutes, or until golden brown. Remove from oven; allow cookies to cool momentarily on the sheets before removing them to wire racks to cool completely. Great Cookies!We replaced 1/4 cup of flour with coco powder makes them more chocolatey and yummy!Every one loves them! I used peppermint chocolate chips instead of peppermint candy and it was fabulous. They were big, soft, and chewy, with the perfect texture! This is so Yummy, I have made it for a friends birthday it was a hitwith the kids of all ages. Very good!!! i added an extra cup of flour to the recipe bc it seemed too runny, and it was fabulous!!! soft and yummy. 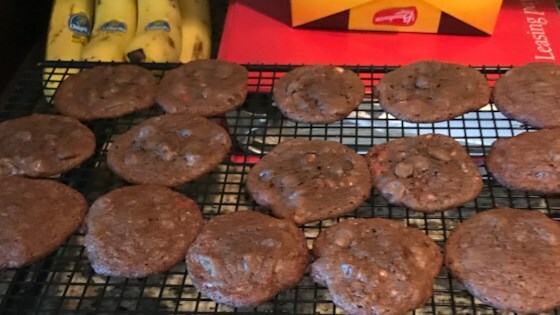 i made these and used the andes chocolate chips along with the others and they turned out great.